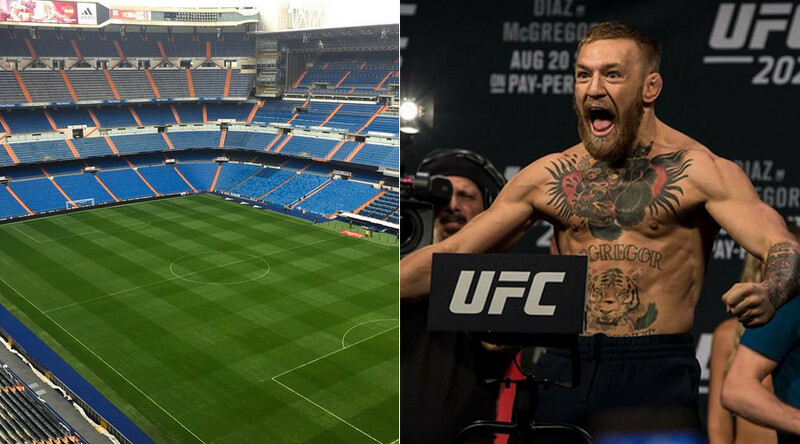 Spanish football giants Real Madrid have expressed interest in hosting a UFC event headlined by brash Irish champion Conor McGregor at their famous Santiago Bernabeu Stadium next summer. A spokesperson for the club told Newstalk.com they would “be glad if we could make a UFC event – our stadium can hold more than 80,000 fans.” It is believed the Spanish club would want to put on an event of mixed martial arts action sometime in May or June next year. Following his $75,000 fine from the Nevada State Athletic commission for his part in the bottle-throwing melee with Nate Diaz and his entourage at the UFC 202 press conference, McGregor has made it clear he no longer wishes to fight in the state. Five of his last six fights have been held in Las Vegas, but he will face Eddie Alvarez in New York at UFC 205 in November for the UFC lightweight championship in his next contest. McGregor has made no secret of his wish to fight closer to his homeland to compensate for the travel cost and distance for his legion of Irish fans to attend fights. The fight with Alvarez being held at Madison Square Garden in New York City, which around 428,000 Irish-Americans call home, goes some way in fulfilling that wish. McGregor has long been in talks with the UFC to hold an event in Ireland. With Dublin’s 3Arena having a capacity of just 13,000, a fight at the Bernabeu could be an excellent compromise for all concerned. McGregor already has a connection to the La Liga giants, having shared a training session with Real forward Cristiano Ronaldo during a visit from the Portuguese over the summer. The Irishman’s drawing power in the UFC would undoubtedly make an event at the Bernabeu a huge moneymaker. His victory over Diaz in the headline bout at UFC 202 earned around $7.6 million at the gate – the fifth largest in the organization’s history. Pay-per-view figures for the event were estimated at 1.6 million buys, putting it in the top three alongside UFC 100 and UFC 196. Officials at Cardiff’s Principality Stadium have also expressed interest in hosting a UFC event, having successfully staged the world super-middleweight title fight between boxers Joe Calzaghe and Mikkel Kessler in 2007. Over 50,000 people watched the bout, and with a fully retractable roof, the stadium could be a viable alternative to the Bernabeu.